Washington Post bureau chief William Booth briefly taken into custody by Israeli police. Police say was likely result of 'misunderstanding'. William Booth, the Jerusalem bureau chief for the Washington Post, was detained on Tuesday by Israeli police near Damascus Gate in the Old City of Jerusalem. An employee of the Association for Civil Rights in Israel (ACRI) was also reportedly questioned by police for approximately one hour before being released. The two were allegedly suspected of incitement. Israeli police reported that Booth had been taken into custody over suspicions the journalist had been paying local Arabs to riot. The two were reportedly speaking with local Arabs just outside of the Old City before being detained by police. Jerusalem Police spokeswoman Luba Samri said Booth was released shortly afterwards, as it was determined the incident was likely the result of a "misunderstanding." "A passer-by complained that he saw a number of people intending to stage a provocation and disruption of order of young Arabs aimed at police officers in the area, allegedly for propaganda purposes," Samri said. "In light of the complaint, officers detained a number of suspects to clarify the facts in a discreet and sensitive manner at a nearby police facility," she said, stressing Booth was released shortly after. 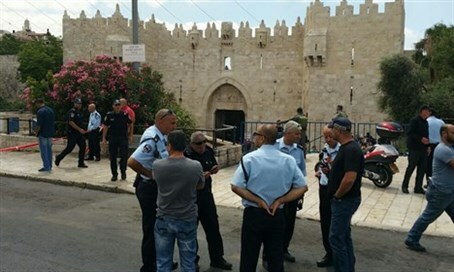 The Israeli government's press office issued a statement later saying it "regrets today's incident at Damascus Gate in which a correspondent for the Washington Post was unnecessarily detained by the Border Police". It said the incident was "probably the result of an unfortunate misunderstanding". "Israel is doing its utmost to enable the foreign press to work freely, without any pressure," it said. "We call upon the security forces and journalists to act with restraint and to avoid confrontations during these tense times." A subcommittee in Israel's parliament last week held a debate over the coverage of recent violence in the country, which some Israeli politicians have accused of being biased against them.